Not many college students can say they assisted with a Bon Jovi concert and got a behind-the-scenes look at the show just hours before it went live at the CONSOL Energy Center. However, for Point Park sport, arts and entertainment management majors Karley Ferlic, Madison Lescallette, Katie Sears and Hilary Wavrek they can now add this rare experience to their resumes. "Overall, this experience was incredible. Getting to see all the behind-the-scenes work was really cool. It will especially help me if I pursue a career in the music industry," said Lescallette, a sophomore SAEM major. As part of their "Because We Can" Community Service Campaign, Bon Jovi opens up its 2013 tour in each city they perform in to a select number of college students looking to gain hands-on experience in what it takes to put together a major concert. According to Ed Traversari, SAEM assistant professor, the CONSOL Energy Center selected Point Park because of its connection to the University's SAEM program. "We asked the SAEM students who were interested in participating to submit an essay describing their community service, outreach and volunteer work and selected four students based on that criteria," explained Traversari. The students gained hands-on experience in events management and public relations as they greeted VIP guests, helped set up Bon Jovi's Fan Club room and assisted with media interviews. "I would love to get into event planning and work at a venue that hosts events such as this," said Wavrek, a junior double majoring in SAEM and broadcast production. Additionally, the students had a guided tour from Bon Jovi's backline crew chief of the concert's full production, featuring state-of-the-art video screens, massive lighting set-up, extensive backline and more. "It was a great networking opportunity because I got to meet and speak with veterans of the concert business," remarked Ferlic, a sophomore SAEM major. "It's another great experience to add to my resume and it has definitely opened me up to the idea of doing backstage work for concert tours." 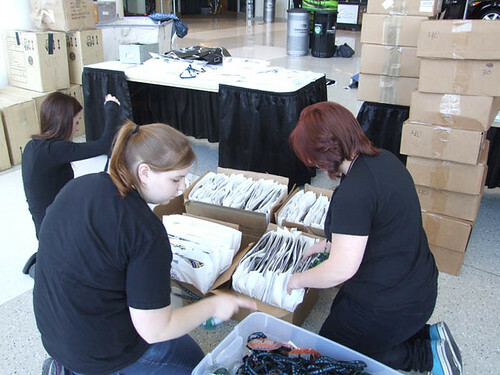 Check out: "Point Park Students Help Set up Bon Jovi Concert Stage," KDKA-TV news, Feb. 21, 2013.